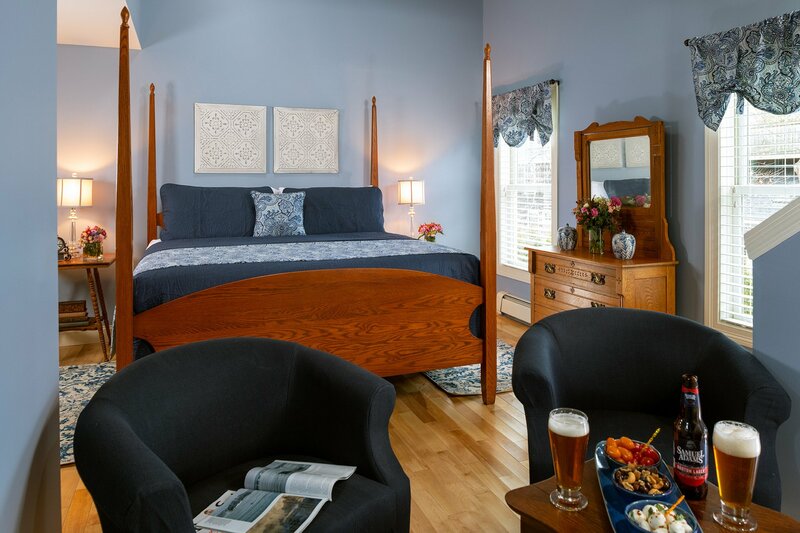 Each guestroom and suite at the Captain Swift Inn is restful and handsomely appointed. 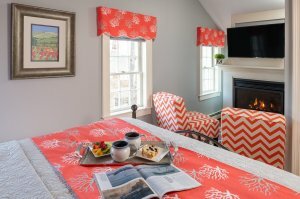 Rooms are located in the main house (original part of the Inn) as well as the newer addition. Rooms in the original part of the Inn may boast pumpkin pine wide board flooring, hand-hewn beams, original 12 over 12 glass pane windows and original fireplaces and molding while rooms and suites located in the newer additions may offer outdoor decks, oversized whirlpool tubs, refreshment bars and more! 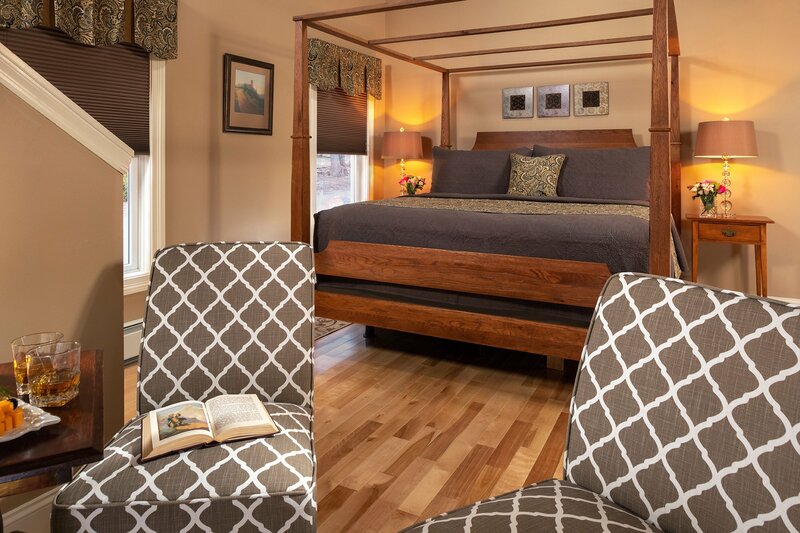 All of our rooms are named after a ship in Captain Swift’s fleet. 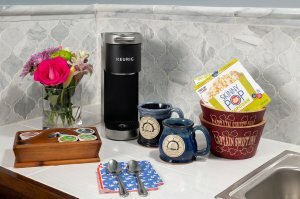 Refreshment Bar with mini refrigerator, stocked with bottled water and soft drinks; microwave with microwavable popcorn and Keurig, with assorted coffees. 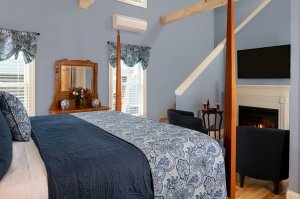 The Grace Bailey is an expansive suite located on the first floor of the newer part of the Inn. 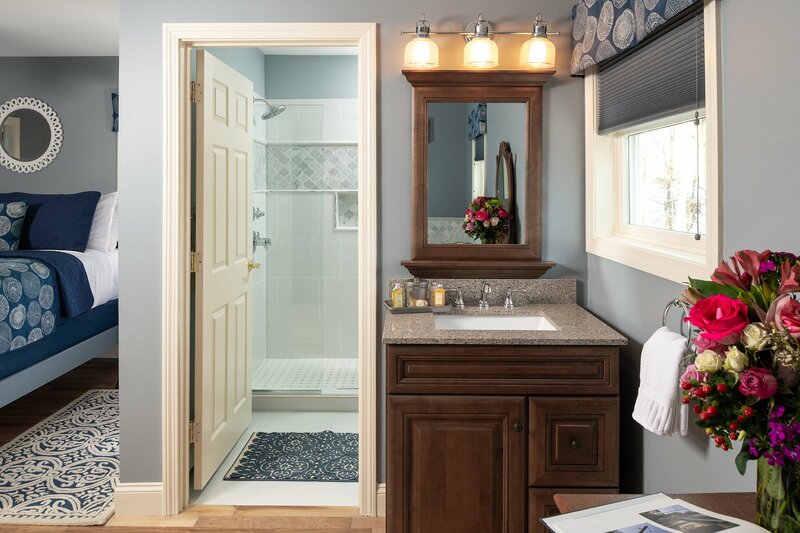 Soaring ceilings, light maple flooring, and four large windows grace this space and bathe it in natural light. 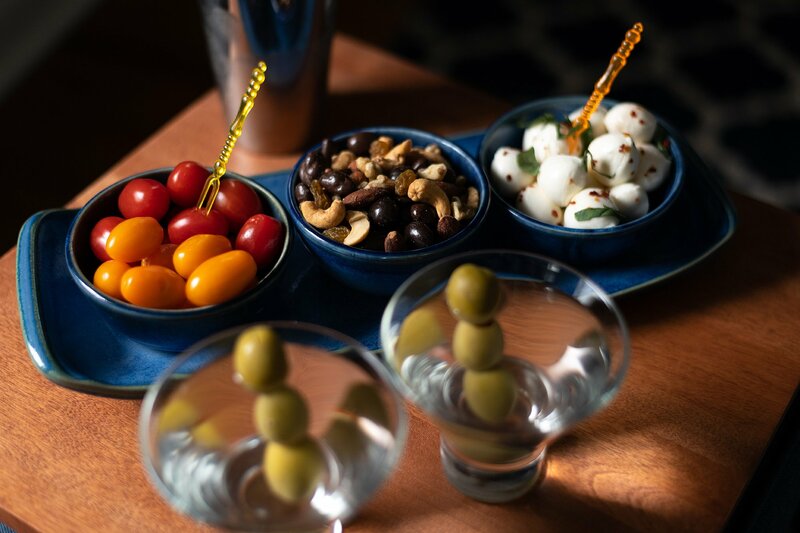 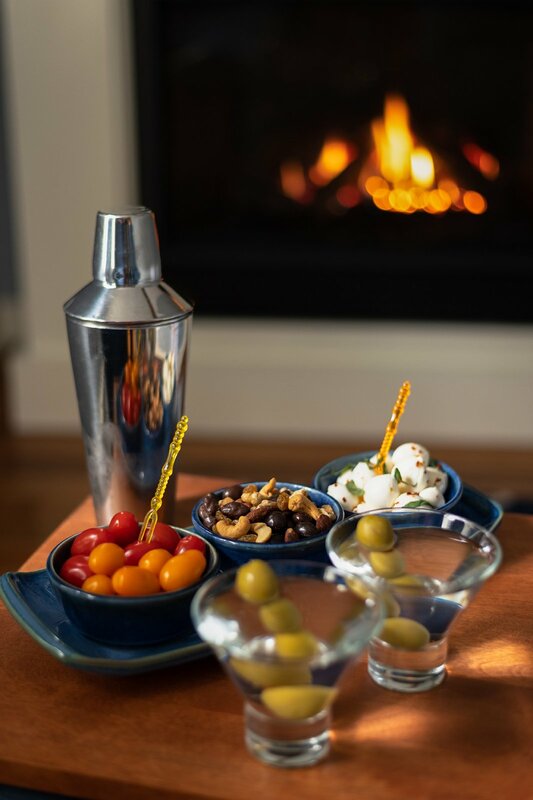 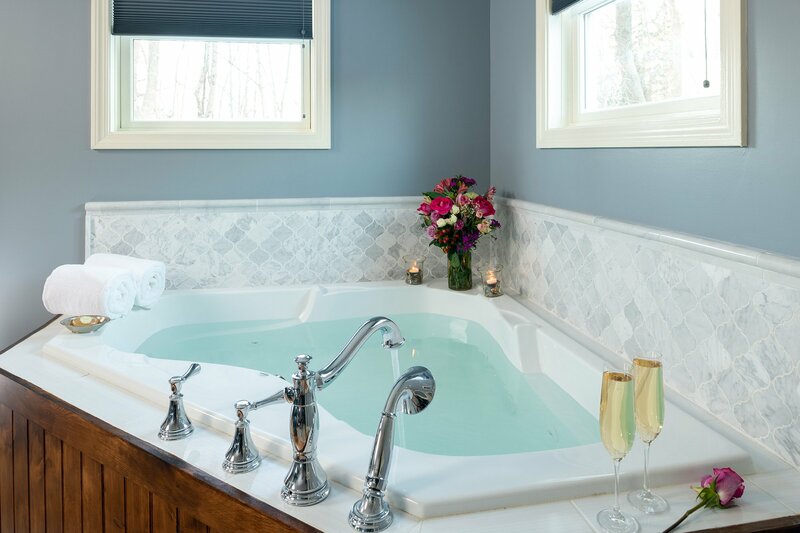 This suite is a favorite for couples celebrating a special occasion. 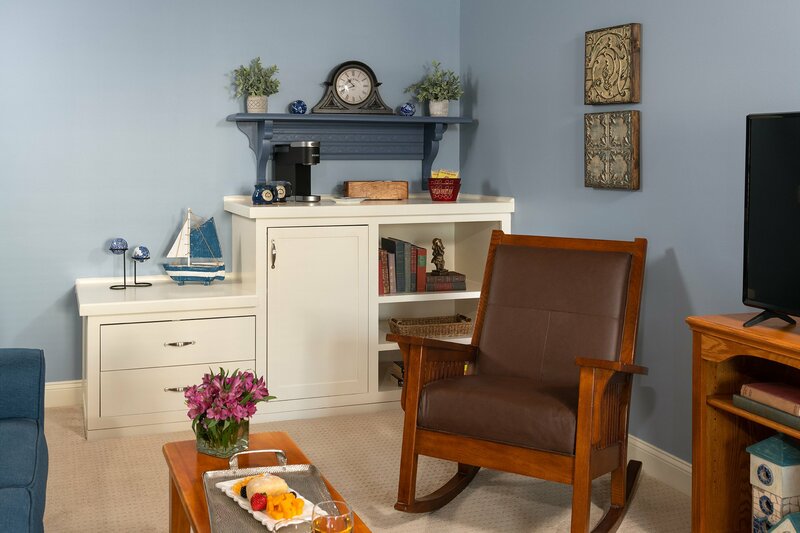 Colors in this room are soothing combinations of blues. 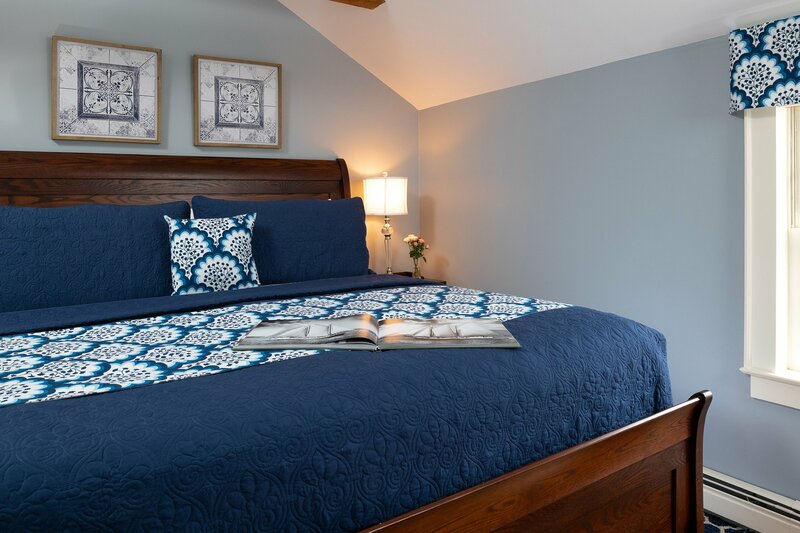 A king size bed with a pillow top mattress; new quality linens and both medium and firm down alternative pillows provide a restful night’s sleep. Two comfy upholstered chairs for you to relax in front of the fireplace (gas), and a flat-screen smart TV with premium channels completes this sitting area. The spacious en-suite bath contains a large spa shower featuring four massage body jets; overhead spray and also an over-sized two-person whirlpool tub. The second level of this luxury suite offers a second sitting area, complete with another flat smart TV, a mini refrigerator (stocked with bottled water and soft drinks), a microwave (complete with microwavable popcorn), and a Keurig, with a variety of coffees and teas. The loft seating area features a queen size sleep sofa convertible bed and mission style chair. 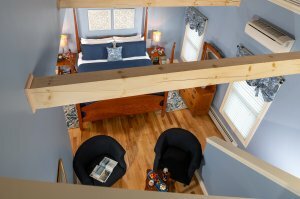 Also in the loft is a game table and chess/ checker set. 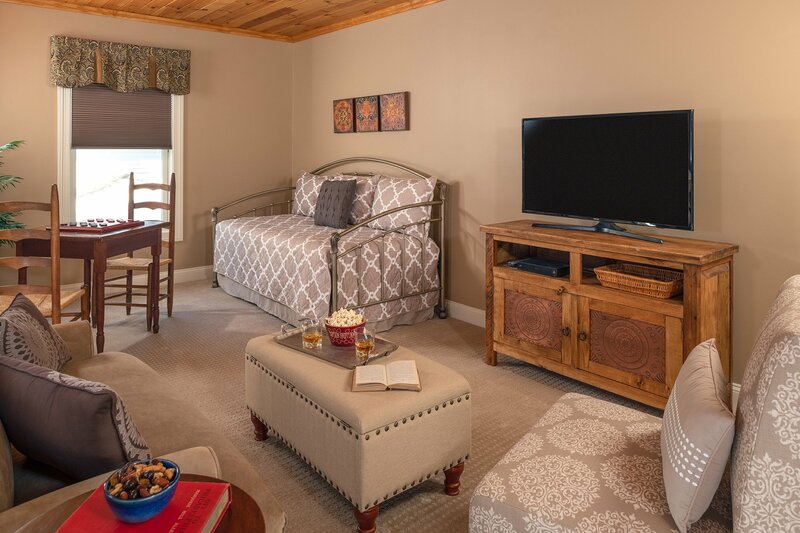 The suite features beautiful whitewashed wood ceilings and beams and is the perfect place to unwind at the end of a long day. 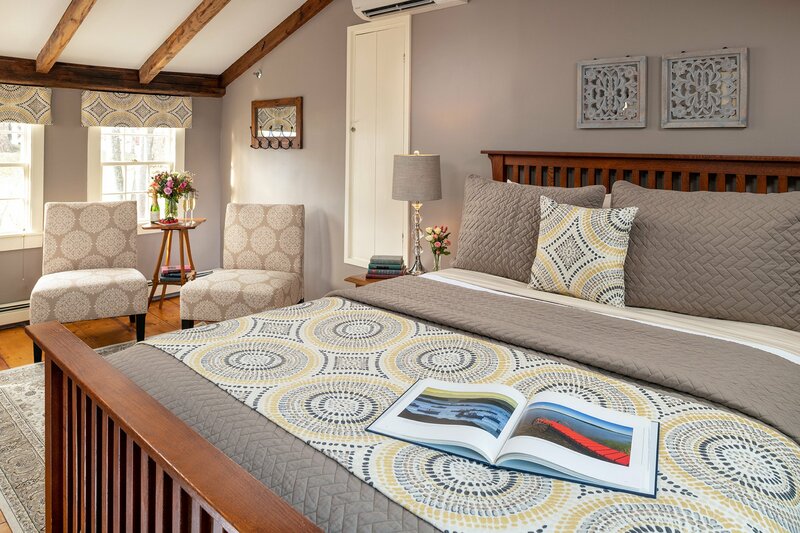 The Grace Bailey Suite can accommodate up to three guests, making it a perfect choice for a family or friends get-away! 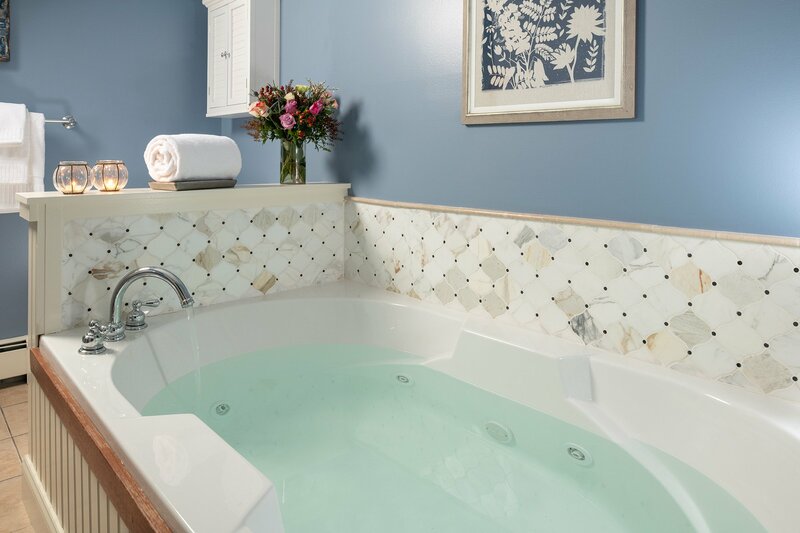 The Mattie is our second luxury loft suite and is identical in layout to The Grace Bailey. 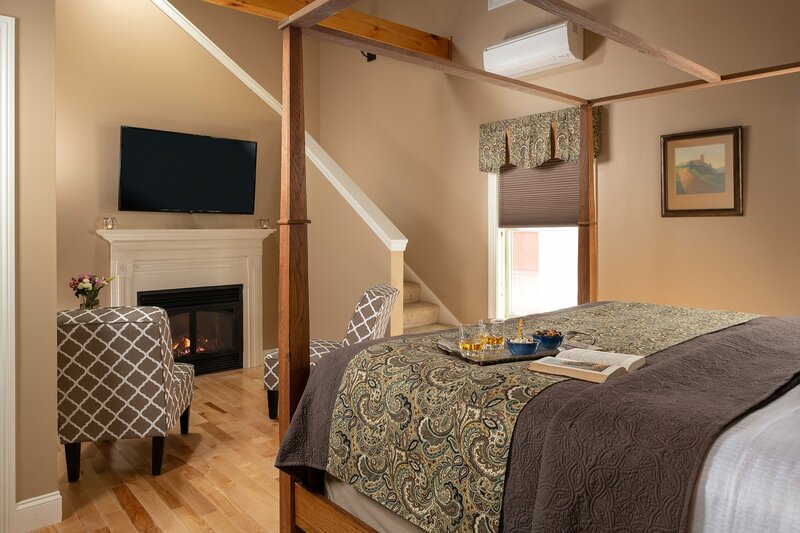 Also located on the first floor in the back, newer section of the Inn, it boasts soaring ceilings, hardwood flooring; warm earth tones of tan, beige, gold and chocolate to soothe the senses. This two-story suite is perfect for a family vacation or a romantic getaway for two. 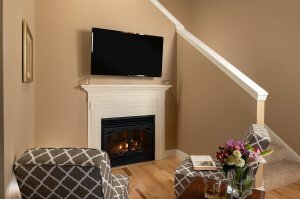 The first floor of this suite features a king-size canopy bed; upholstered comfortable chairs in front of the fireplace (gas) and a flat-screen smart TV with premium channels. 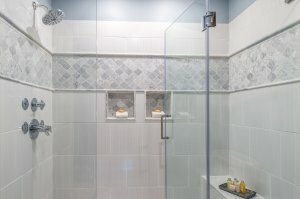 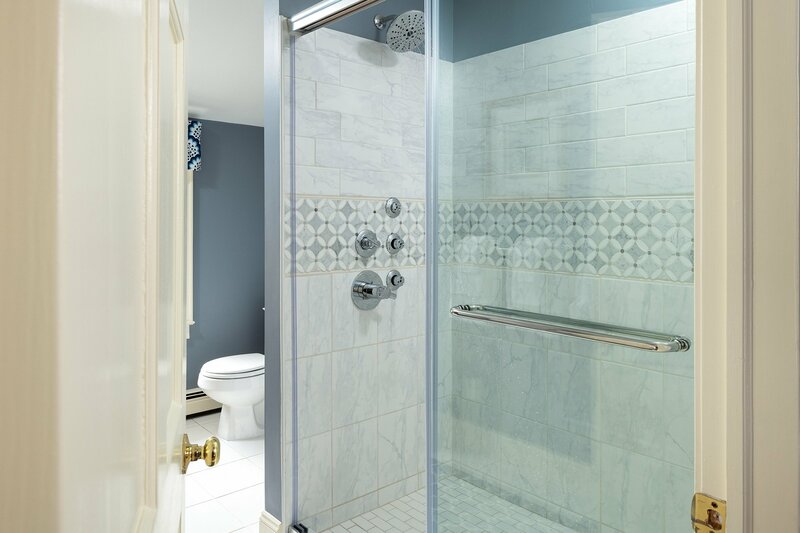 The large en-suite bath showcases an over-sized two-person whirlpool tub and separate large tiled spa shower featuring four massage body sprays and overhead shower. The upper-level open loft has an upholstered settee and an upholstered chair, along with a twin-size daybed, which can accommodate an additional guest for a maximum of three. 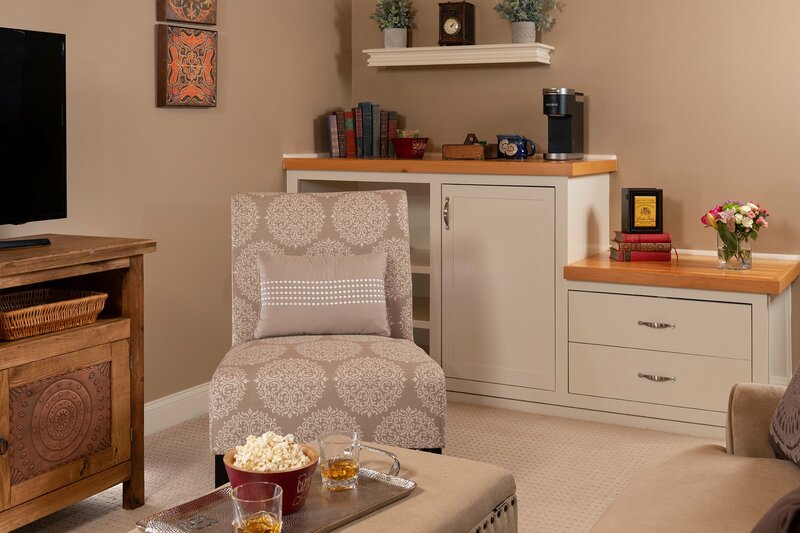 A game table, with a backgammon set, sits in the corner beckoning guests to play. A second flat screen television, a mini refrigerator (stocked with bottled water and soft drinks), a microwave (complete with microwavable popcorn) and a Keurig, with a sampling of coffees and teas, complete this incredible space. 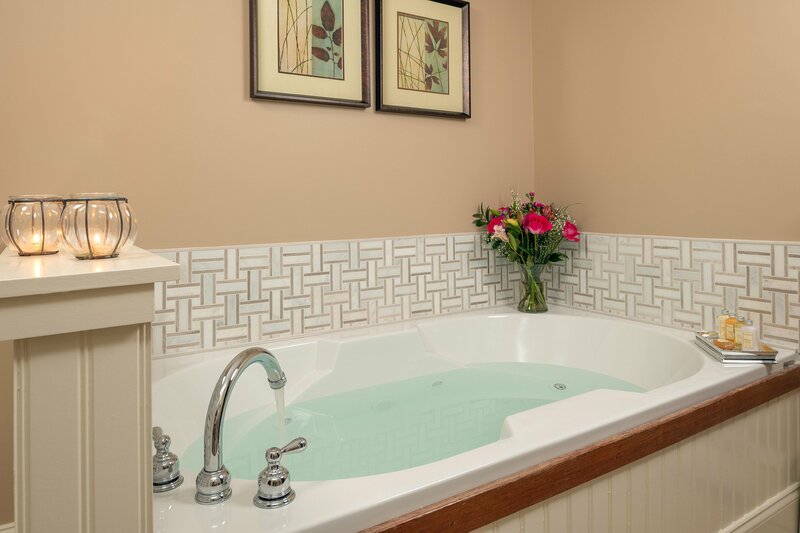 Your private retreat awaits! 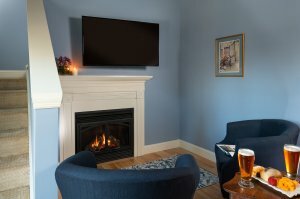 The Mercantile is located at the very end of the newer addition to the Inn, and has it's own private exterior entrance off the parking lot. 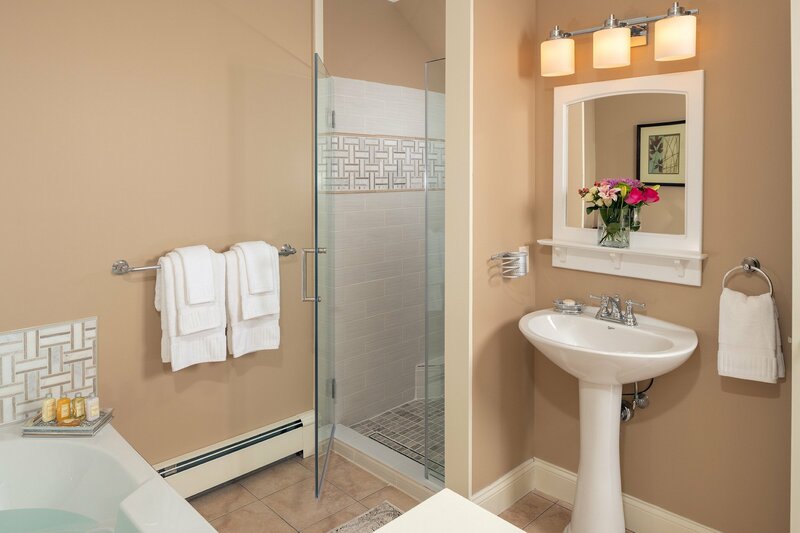 You'll be welcomed by a small stone patio complete with Adirondack chairs as you approach your suite. Once up the exterior stairs (a short flight of 8 steps), you'll enter this lovely space. Five windows grace this suite and capture lots of natural light. 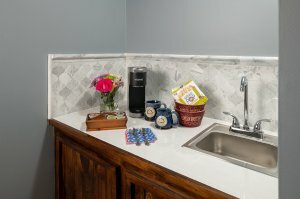 This is a large one-room suite complete with a sitting area which includes a refreshment bar (outfitted with a sink, mini refrigerator (stocked with bottled water and soft drinks); a microwave (complete with microwavable popcorn) and Keurig, with a sampling of coffees and teas. 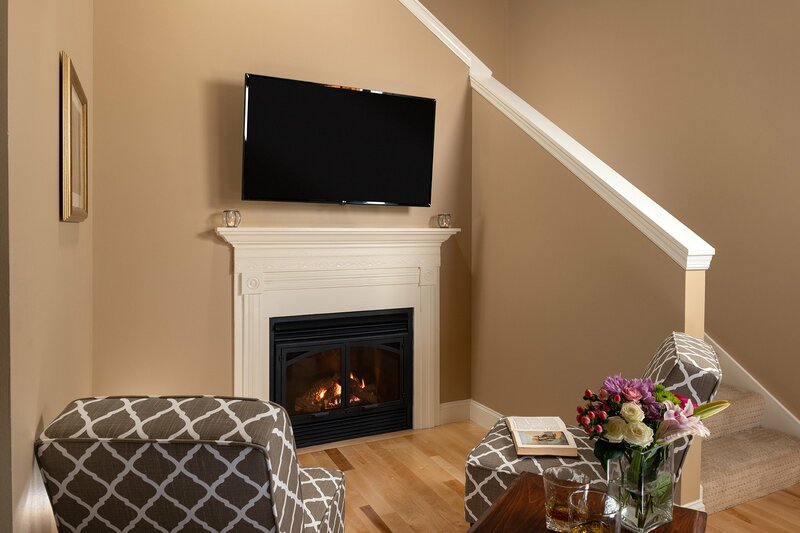 Also included are a fireplace (gas); a settee and upholstered chair for relaxing as well as a large flat screen smart TV with premium channels for your enjoyment. 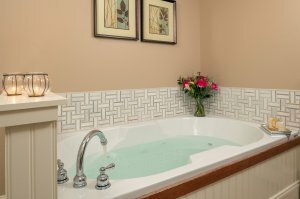 In one corner of this suite is the large two-person triangular whirlpool tub - perfect for a soothing soak or an invigorating bath! 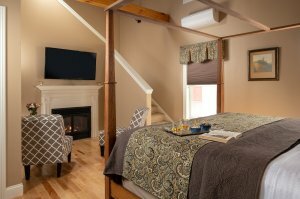 The cottage style king size bed with pillow top mattress, premium bedding with both medium and firm down alternative pillows are at the ready for your relaxation. 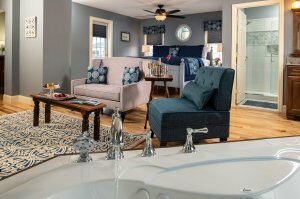 The crisp shades of navy blue, white and grey compliment the feeling of this cottage retreat! 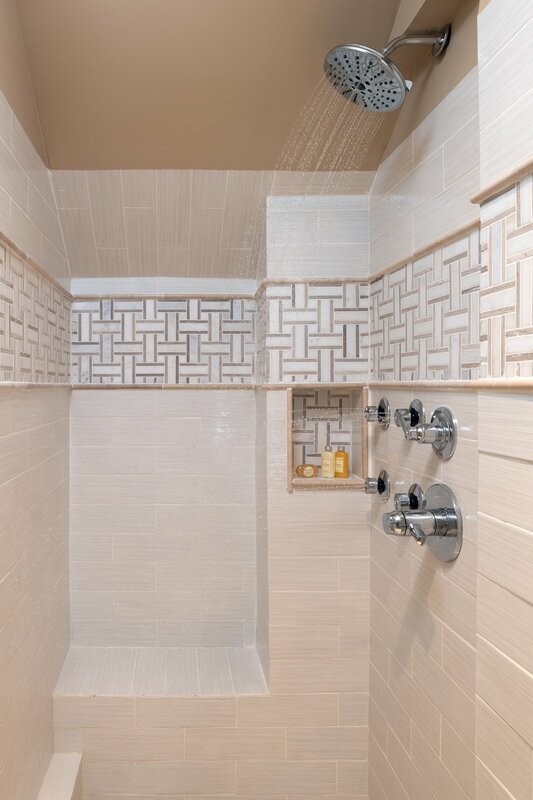 The en-suite bath boasts an impressive six-foot plus spa shower, complete with four massage body sprays and shower head. 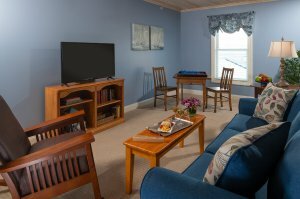 A garden door leads to your private deck, with white rocking chairs and flower boxes, a perfect space to read your favorite book! 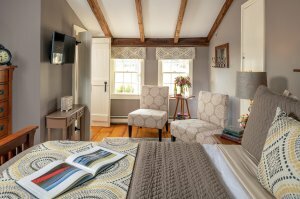 Located on the second floor in the original section of this glorious 1810 Inn sits the Annie F. Kimball. 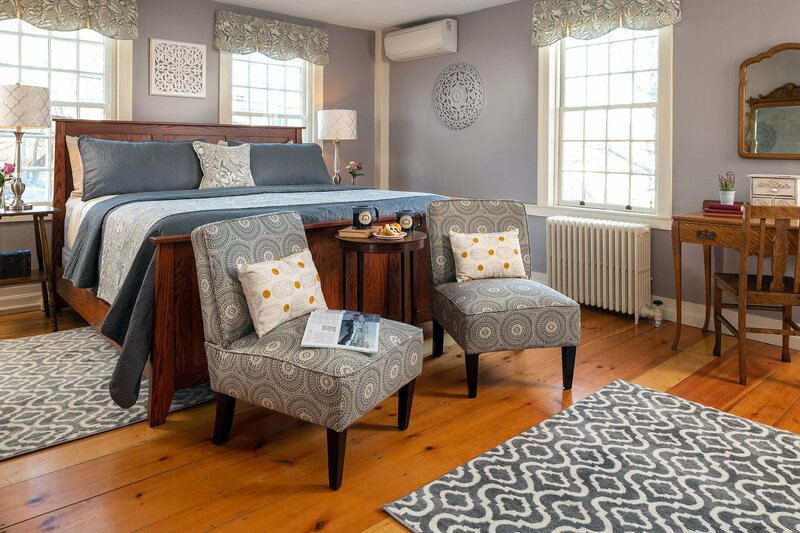 Most likely the master bedroom back in the day, Annie is a large guest bedroom , with chair molding, original pumpkin pine wide floor planking; three large original twelve-over-twelve windows and a spacious walk-in closet complete with built-in bureau which is original to the Inn. This sun-filled room features a king size pillow top bed; quality linens and both medium and firm down alternative pillows. 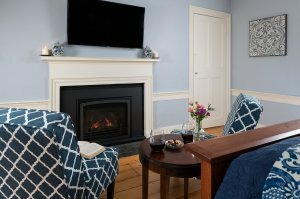 The room is warmed by muted tones of greys with a pop of yellow, features two comfortable upholstered chairs positioned in front of an original fireplace (now gas operated) and an antique mirrored dresser and writing table provide a relaxing place to spend an afternoon reading a book from our library. The ample sized en-suite bath consists of a recently enlarge tiled spa shower complete with three massage body sprays and shower head. A large window brightens this space. If you are a light sleeper you may prefer a room situated further back in the Inn, however, sound blocking window inserts have been installed for your comfort. 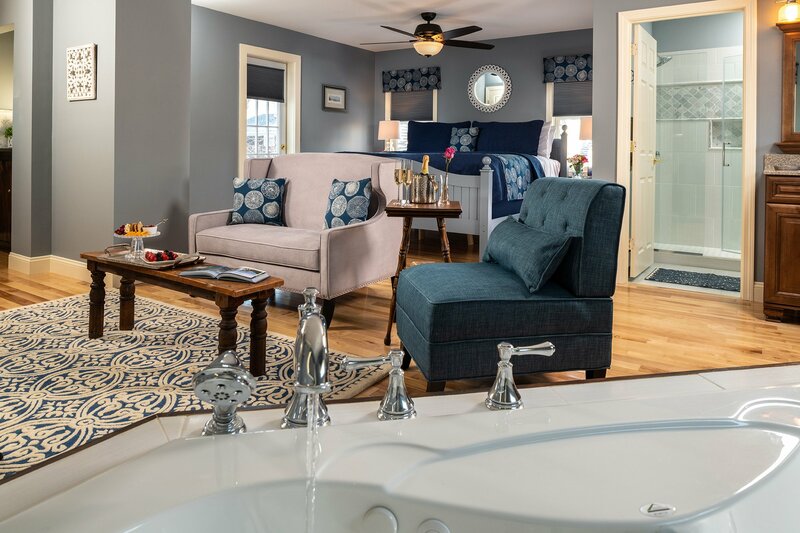 The Lydia M. Webster is similar in layout and shape as The Annie F. Kimbal and is also located on the second floor in the original section of the Inn. 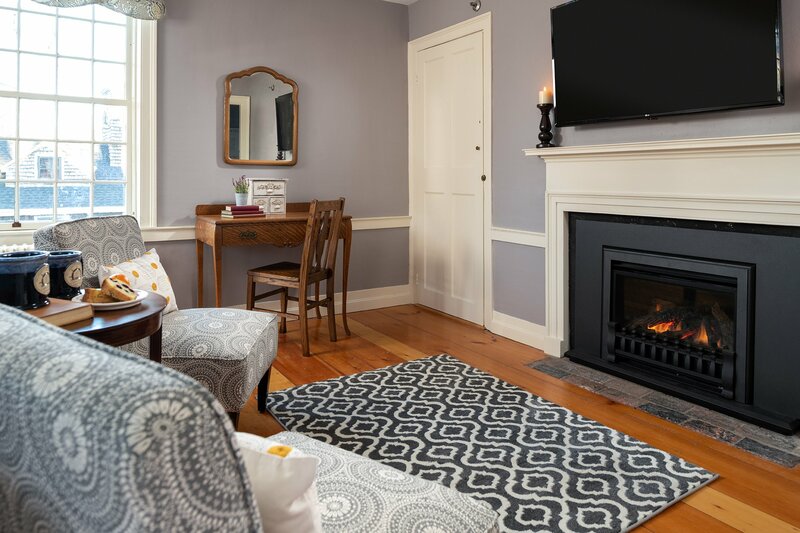 This inviting room boasts three twelve over twelve original pane windows; pumpkin pine wide board flooring; an original fireplace, now gas operated, and original chair rail molding. It’s large closet, considered a walk-in back in 1810, also has a built-in dresser. 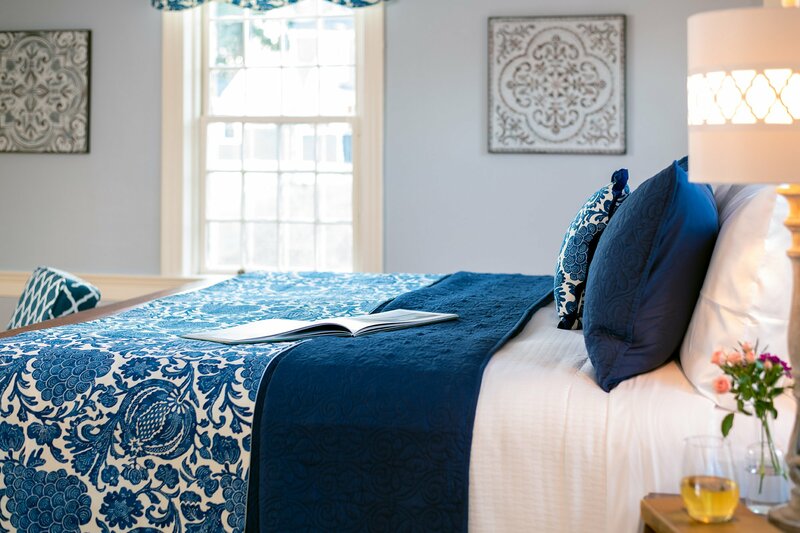 The crisp navy and white fabric and cool light blue walls are soothing to the senses. 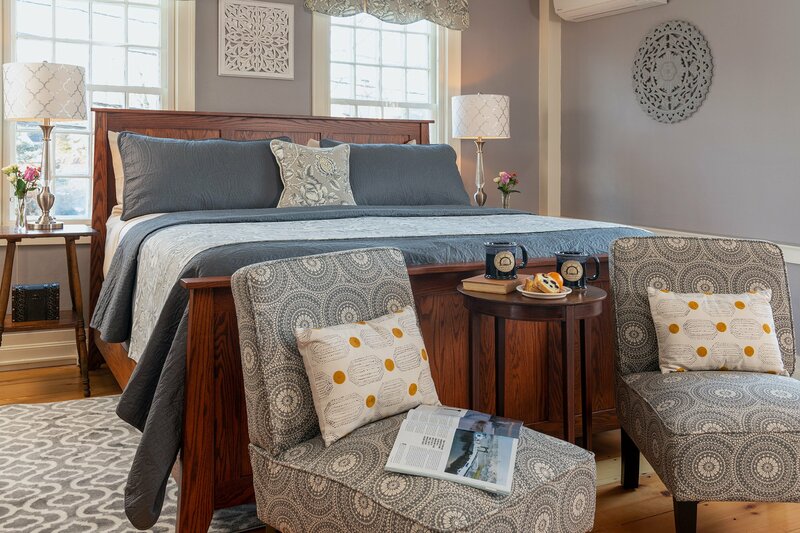 A king size pillow top bed, oak antique mirrored chest along with two upholstered chairs in front of the fireplace complete this inviting space. The newly tiled en-suite bath features a spa shower, with three massage body sprays and overhead shower. 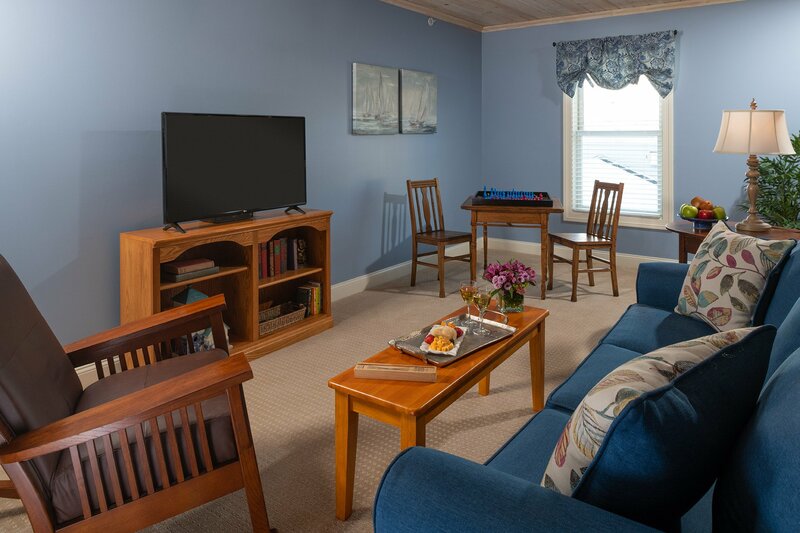 The Lydia M. Webster also faces faces Elm Street (Coastal Route 1), so light sleepers bothered by traffic noise may prefer a room further back in the Inn, although sound reduction window inserts have been installed for your comfort. When the Hunt Locke house was first converted into an Inn in the mid to late 1990s, the original innkeepers created this space (along with the neighboring room) as their owners’ quarters. 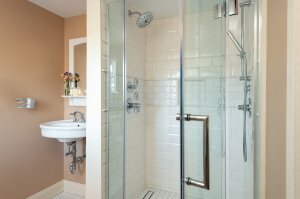 It is believed that it was storage space in the back of the original home. Today, The Lois M. Candage boasts exposed beams, sloping and cathedral ceilings and is located on the second floor of the Inn. Two windows in the bedroom and one in the bath lets just enough natural light in to grace this lovely room. 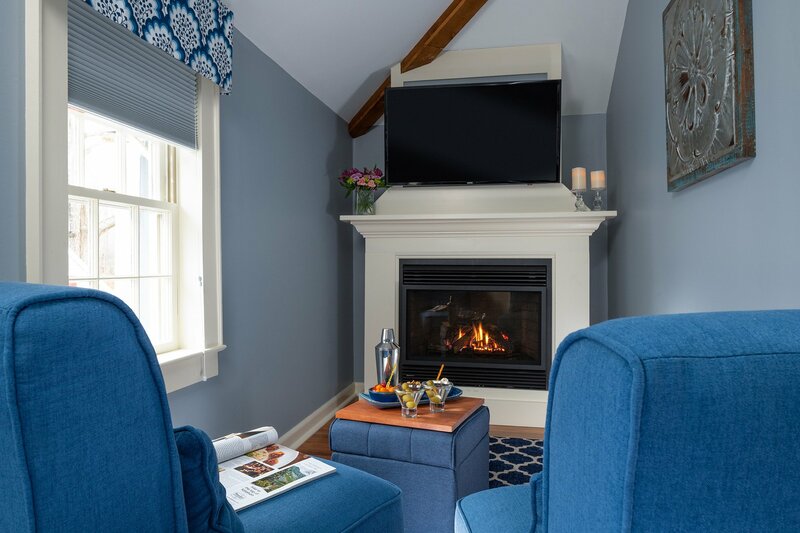 A nook, complete with fireplace (gas operated), two upholstered chairs and ottoman create a comfortable place to watch television or listen to music while reading a book. This room is decorated in fun shades of sapphire and periwinkle and has a king-size sleigh bed. 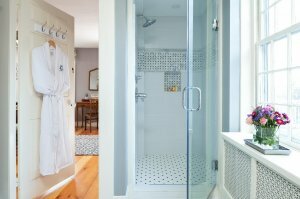 The large en-suite bath features a five-foot tiled spa shower, featuring three massage body sprays and an overhead shower. 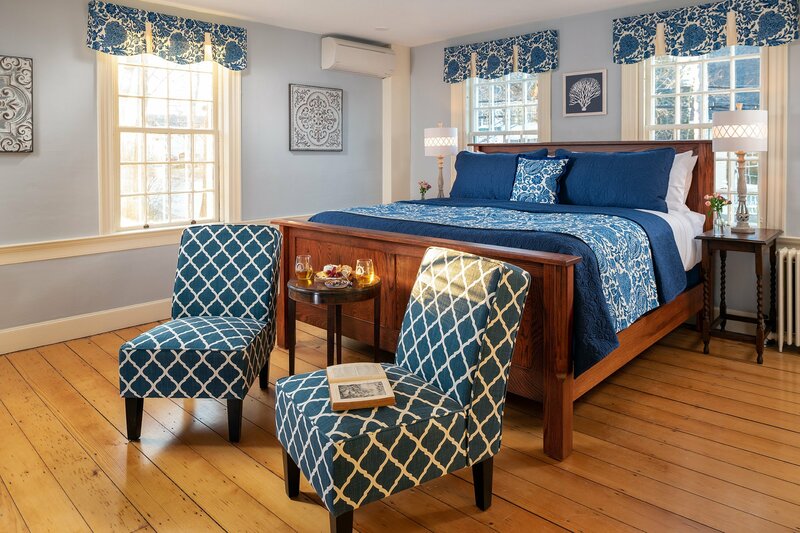 Almost a mirror image of its neighbor The Lois M. Candage, The Eva S. Cullison is located on the second floor of the Inn, accessed only by the original staircase off the Keeping Room. 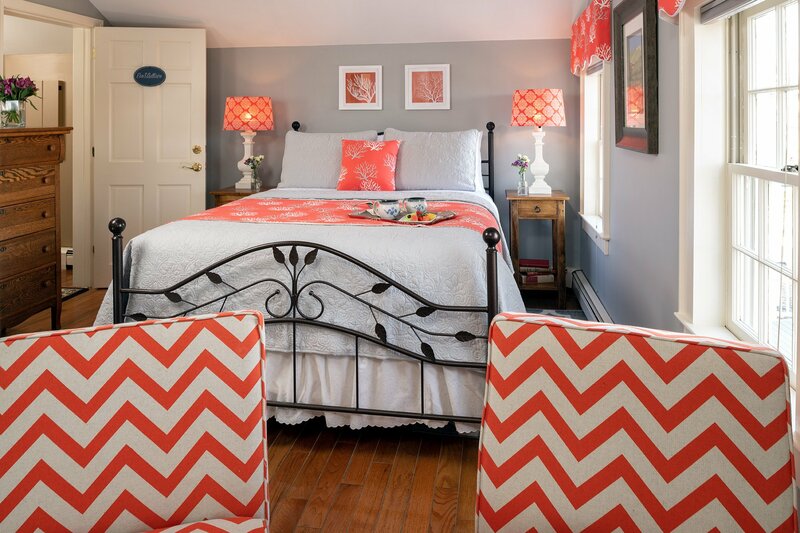 This delightful room features a queen size bed; is decorated in fun tones of coral, white and a splash of grey. 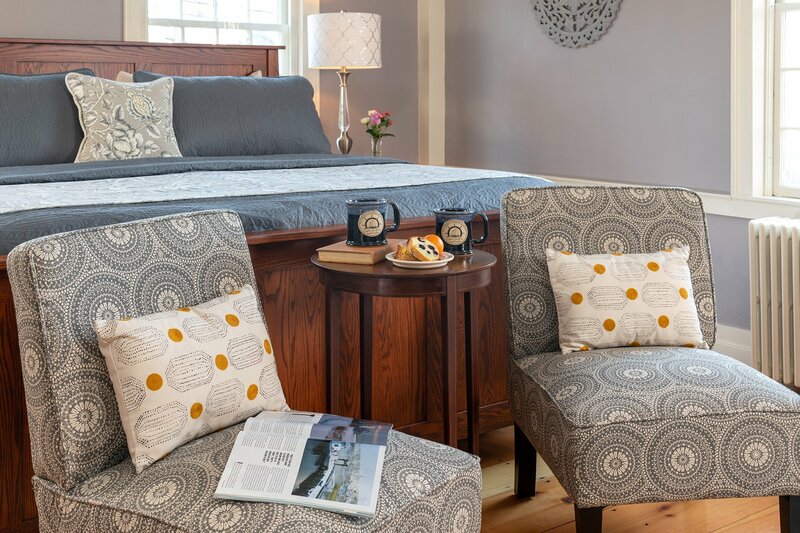 An iron bed and antique oak dresser with an attached mirror create both a useable and attractive space. 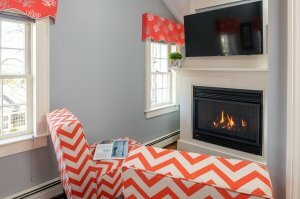 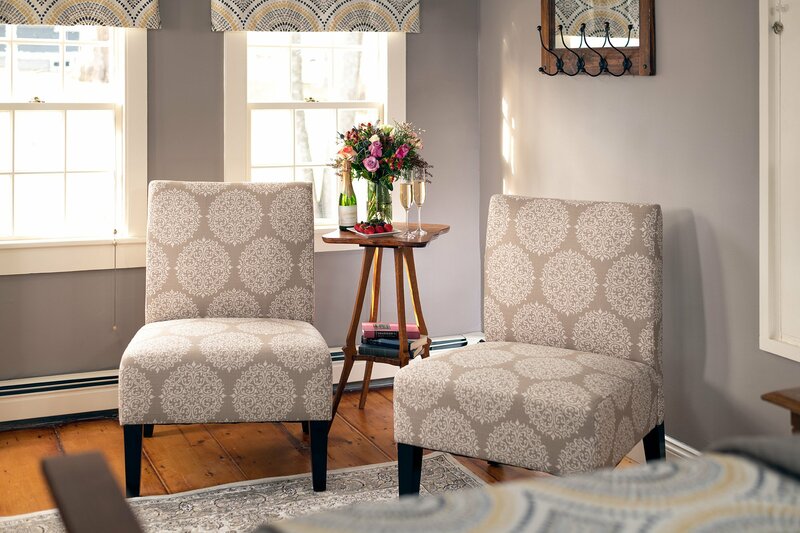 A reading nook, complete with a fireplace (gas operated) and two upholstered chairs make this room a comfortable place to unwind after a busy day. 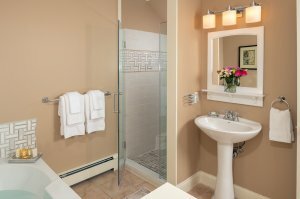 The en-suite bath offers a tiled spa shower, with three body sprays and an overhead shower. Mabel is a charming second-floor room, one of three that can only be reached from the Inn’s original rear staircase off the Keeping Room (former kitchen). 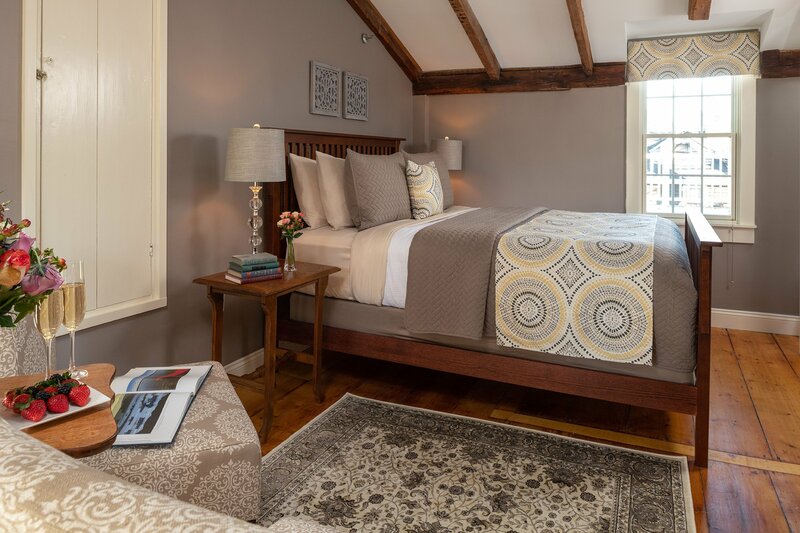 As part of our renovations, this room has almost doubled in size, nicely accommodating a queen-size bed. 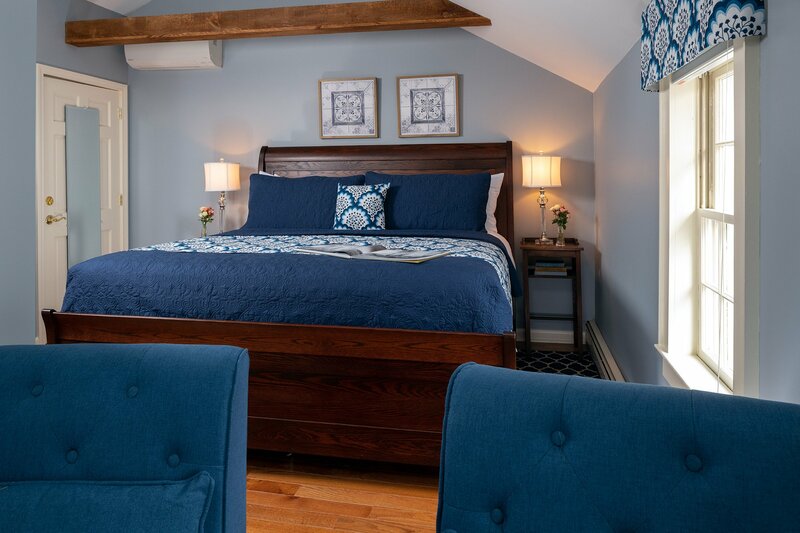 It showcases original hand-hewn beams with original square beam nails along the pitched ceiling, creating a cozy and historic feeling. 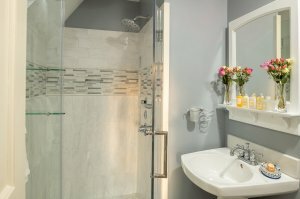 This room is done in a palette of taupe, grey and a splash of yellow. 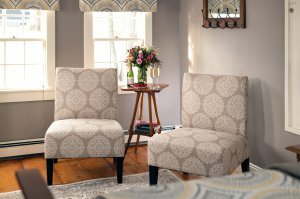 A seating area, complete with two upholstered chairs and a flat-screen smart television, provides relaxing space for guests to rewind. 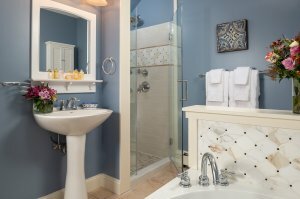 The en-suite bath has a tiled spa shower with three massage body sprays, plush towels, and fine bath toiletries. 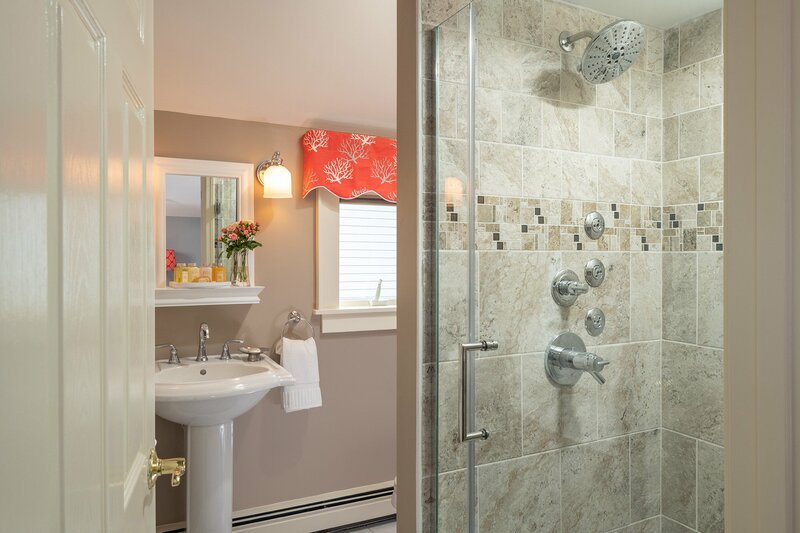 Three windows in the room and another in the bath brighten this space. 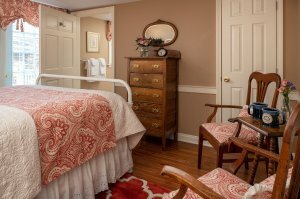 Located on the first floor of the Inn, in a hallway across from the Inn’s kitchen, you’ll find The Lillian. 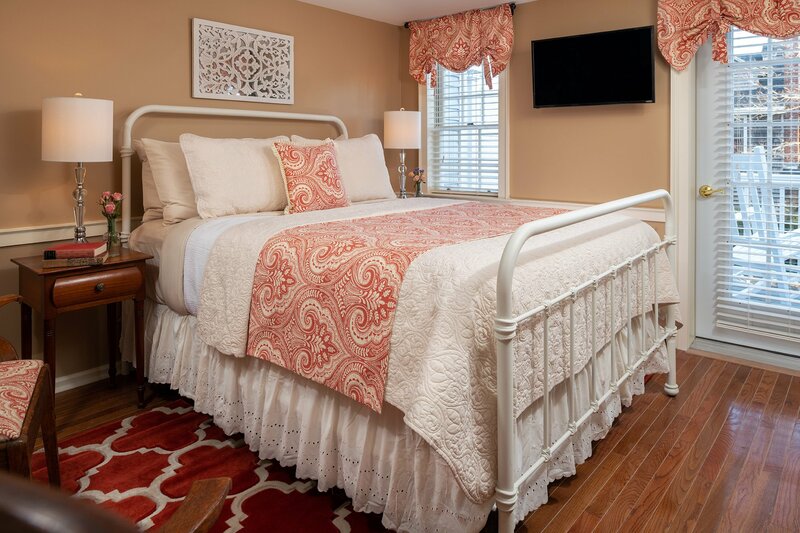 This is our smallest guest room and is decorated in shades of terracotta and cream. The Lillian features a queen size iron bed; an antique bureau with mirror, two antique oak sitting chairs and despite the smaller room size, it also has a closet. 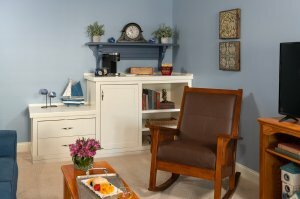 A garden door leads to a private deck with white rocking chairs and flowers and is a peaceful place to refuel! 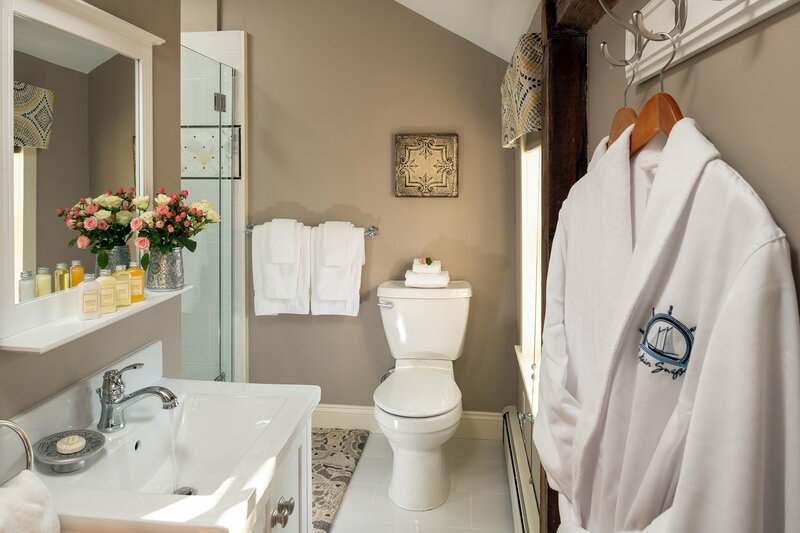 A good size en-suite bath, with a large tiled spa shower with three body massage sprays and overhead shower as well as a hand held shower wand, complete this charming room.